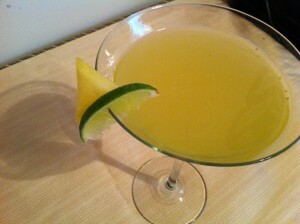 Tonight we bring you a tropical twist on a classic cocktail you’ve seen on this blog before: the Gimlet. Now a classic vodka (or gin) gimlet conjures up dimly lit dives with dangerous dames waiting to wreck your life for a smile. Ok, I’m a sucker for all that is Raymond Chandler. This little lady is what Philip Marlowe would order while tracking a shady character to a tropical locale. Muddled fresh pineapple and chunks of ginger root, fresh lime juice, Rose’s lime, vodka-all shaken with ice and strained out into the glass. Sweet and tart at the same time, with a subtle hit of heat from the ginger. If you prefer a sweeter drink (the fresh pineapple provides plenty for me), add a bit more Rose’s lime. This is a delicious drink. You can taste all the individual ingredients, yet they dance in the glass to somehow become a new flavor blend. I love it. 4 3/4 Olives. Perfect for a summer bbq, luau, or just whenever you want a mini vacation in a glass. Happy sipping and happy weekend!